I have had significant problems with watching flash video in 64-bit Ubuntu. Does anyone know of a good way to get flash running on the platform? Are you installing it from the Ubuntu Software Center? Go to Applications->Ubuntu Software Center. Click the Adobe Flash Plugin 11 and click install. Note: this is the method I use on my 64-bit Ubuntu install and it has yet to fail me. Two entries will be found. The first is the wrapper around the 32bit flash version from Adobe. The second is the 64bit flash version. Select the second flash entry - if the following picture is seen then you have not already enabled the Canonical Partner Repository previously. Click the Install button and enter your password when prompted. Note - you must have permission to install software. 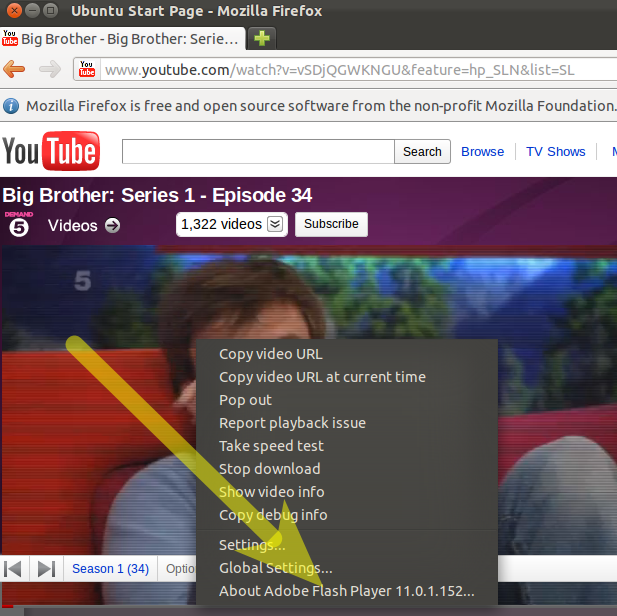 Once complete - launch Firefox and browse to your Flash Video. Right click and confirm that the latest version of Flash has been installed correctly. Go to this page and select the option .tar.gz for other Linux. Download the file. Unpack the plugin tar.gz and copy the files to the appropriate location. Save the plugin tar.gz locally and note the location the file was saved to. Launch terminal and change directories to the location the file was saved to. Since you have stated that this is the first time you have ever used ubuntu. i would suggest that you install the package ubuntu-restricted-extras, this includes lots of useful stuff like adobe flash and codecs and MS fonts etc. synaptic: search for the package ubuntu-restricted-extras right click the package and select install, and then select mark. after click the apply button and it will all install. There is a simple solution for this problem. Open your Firefox and go to Youtube. Click on any video. Definitely it won't play because you don't have any flash player installed. But Firefox will promote you to install missing plug-in at the top. Simply click on it and follow the procedure. After that your video will start to play. Make sure you have latest Firefox browser installed. Get my Flash-Aid extension for Firefox. It will take care of downloading and installing the appropriate version for your system architecture and will also remove conflicting plugins. If you are on 64bit, it also allows to install the 64bit preview version, which renders better results than the 32bit with nspluginwrapper. BTW, if you can't copy anything to ~/.mozilla/plugins folder, then you should check the ownership of the ~/.mozilla folder. It should allow to copy anything there. Unless of course you are referring to a system folder outside your home directory, which requires root privilege. It depends on what browser you are using. Google Chrome (not Chromium) has Flash player by default. When you click on the .deb file when it has downloaded it will open in the Software Centre. Now click install and when it has finished you can find the browser in Applications -> Internet. Use the Ubuntu Software Center (in the Applications menu). In the text entry field (of the search box), you can search for "flash", and the results will populate one Adobe Flash plugin (note the Adobe logo). Choose that, and follow the directions to use the source. Double check which "plugin" directory is being used. Had to spend a good hour one time just plowing through all the plugin directories till I found which ones my firefox was actually reading, and then ln -sed them all to point to a common one. End of the day you might be dropping it in the wrong place. Also anything in /usr/lib/... is owned by root so you would have to sudo cp libflashplayer.so /usr/lib/firefox/plugin where .../firefox/plugin points to the location of the firefox plugin directory. I fixed 64 bit Flash on my 11.10 systems without any wrappers. If you follow the solutions mentioned above you will still end up with the 32 bit version and wrappers. Note: most of this can be done in a terminal as well, in that case you don't need to install Synaptic. Furthermore, it could be that just executing steps 5, 6 and 8 is enough, but I have not tested this yet. Remove all flash-related packages (such as flashplugin-downloader:i386, flashplugin-installer, ndiswrapper-common etc.). If there's nothing listed you probably don't have Flash installed at all. In that case, just move on to the next step. Install the package 'adobe-flashplugin'. If it's not in the list, something went wrong with updating the package lists. Try quiting and restarting Synapic, then click on 'Reload'. One extra package, 'adobe-flash-properties-gtk' will be installed automatically. Nothing more. Now you will have full 64 bit Flash without any wrappers and other garbage in both Firefox and Chromium. A restart of your browser(s) is required though. If it's still not working, try a reboot (there might be some bogus reference to the old plugins somewhere). Here's what you need to do: by default, Ubuntu comes with only open source software enabled (I think that's the case, anyway). The way you enable other stuff (like Flash, Java, and support for recording or playing MP3s, which is NOT open source) is to go in your Software Center, go in the menus (unfortunately I'm not currently on Ubuntu and can't tell you which menu) and search for Software Sources. 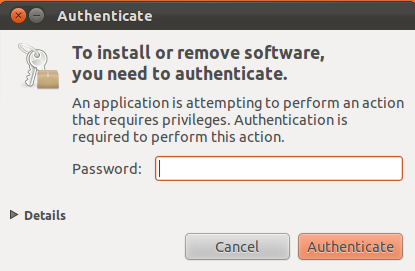 Click it, and you'll be brought to a window which tells Ubuntu what it's allowed to install for you. In front of you should be a list of five different "universes". What you need to do is enable the two that aren't currently enabled. and let it finish. 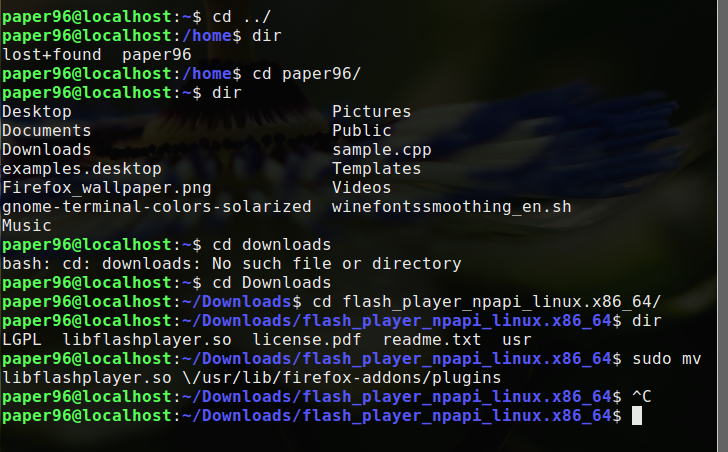 Then you should be able to find flash in either the Software Center or in the command line. You could alternatively install the ubuntu-restricted-extras package, which will give you all of the three things I mentioned above. I went through as many possible suggestions as I could find in an effort to get flash to work in Chrome on my 13.10 64bit installation. Nothing worked. I finally stumbled on the Pepper Flash answer. Hopefully this solution will work for some time. does not work (like in my case and I do not know why...), you may want to give Opera as your browser a try. It is the only one that works for me. PS: I do not want to advertise Opera a browser, it's just that this was the only solution that somehow worked for me. Finally, restart Chromium so changes take effect. Probably, it wouldn't be a bad idea to create a bug report on Chromium/Firefox package maintainers to alert about the bug and the simple solution. Well I post this here, in hopes of helping someone. I'll state what was happening and how I solved it. Running 12.04 from a WUBI installation. 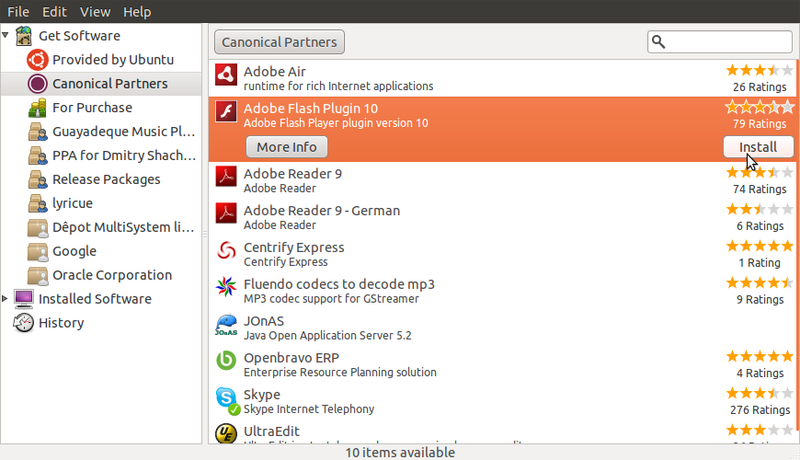 When I searched in the Ubuntu Software Center the keyword flash, none of the options posted here appeared except ONE for a flash plugin for Mozilla. When attempting to install it, I got a dependency error. Tried installing it through the Ubuntu Restricted Extras from Ubuntu Software Center, however the flash plugin portion of this installation did not work because of the dependency error. and ran it from the terminal. which I found from some other post that was trying to solve dependencies. 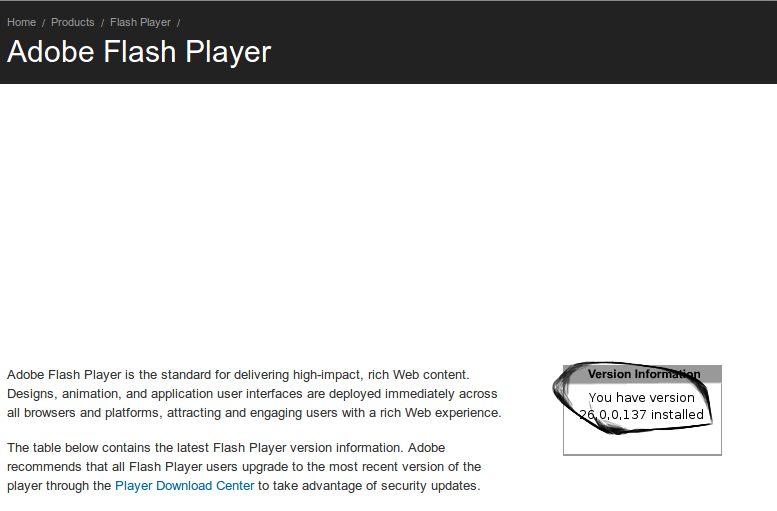 and flash plugin now works on Chromium and Firefox. It depends on how you are installing. is it via a tar.gz file or rpm or some other method. There are a bunch of ways to get flash. This is only verified on Firefox also if you have Chrome/Chromium you don't have to install it. Open this link. It will automatically suggest you a version according to your desktop environment. Select .tar.gz for Linux option as shown in below screen-shot. Now click on Download Button (Select the downloading path as Downloads in your system for easy access). Now extract file by Right clicking on folder and selecting Extract Here option. 5.3. cd Downloads (this is the folder where you have downloaded the file in Option 3). 5.5. sudo mv libflashplayer.so \/usr/lib/firefox-addons/plugins hit enter and thats it. Now close your browser(Firefox) and Terminal. Restart Firefox and now you have Flash Player in your browser. Visit this link to verify. Not the answer you're looking for? Browse other questions tagged flash software-installation or ask your own question. How to install flash payer in Ubuntu 14.04 LTS? How can I install 'Adobe Flash Player' offline? What Linux version of Flash do I download? 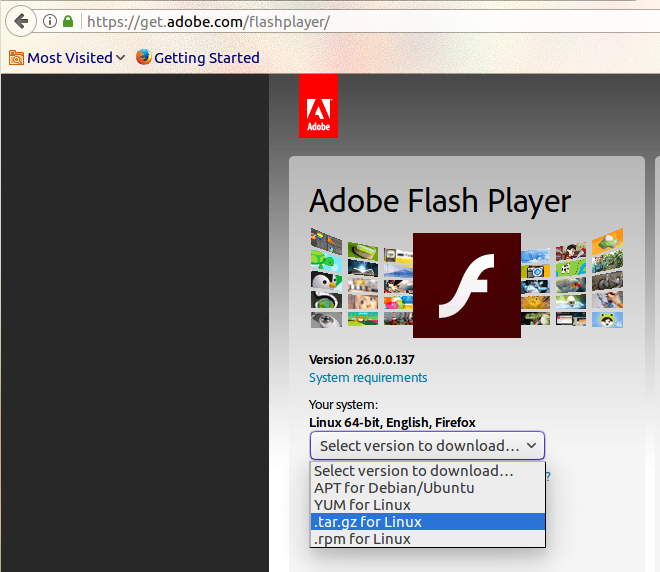 How can I install Adobe Flash player?